Have you met the Small Hive Beetle yet? Aethina tumidda, or (SHB) to be exact. The beekeeper walks out to the hive to perform a routine hive inspection. The top is removed in anticipation of being greeted by busy honey bees. But wait… what are those black beetles running around in the hive? You have just met the Small Hive Beetle. Is this a big problem? Yes, it sure can be a big problem. This small, oval, black/brown beetle doesn’t sting or bite. Yet a large infestation of beetles can bring a strong hive to “its knees”. What Are Small Hive Beetles? Also referred to as (SHB), Small Hive Beetles infect most of the honey bee colonies found in their native area. But unlike here in the US, the Small Hive Beetle is not a major pest in Africa. We don’t know how Small Hive Beetles made it to the United States. Most likely they came in with a package of bees from an infested region or on a cargo ship. They were first noticed in the Southeast during the late 1990’s. The beetles have spread to over 30 states since that time. Though more numerous in the warm states, cold weather does not seem to deter beetle populations. The type of soil found in any given area plays a bigger role than the average temperatures. Clay soils are less inviting to beetle reproduction. Beekeepers living in a region with sandy soil can expect more problems with Small Hive Beetles. Actually, my soil is rock hard red clay and I still have some beetle issues. I can only imagine what the fight would be like in softer soil. The more you understand about Small Hive Beetles, the better equipped you are to battle them. With these beetles, we are dealing with an insect – that causes problems for another insect. Many of the things we could do to kill beetles will also harm honey bees. Read and learn everything you can about Small Hive Beetles. What do Small Hive Beetles Look Like? You will find infestations of small black beetles running around on the frames or under the inner cover. Sometimes called bee hive beetles, this pest is small but can do a lot of damage in large numbers. Adult Small Hive Beetles measure about 1/4″ long and are dark-brown to black. The size of beetles in the hive can vary. It is not uncommon to see larger and small beetles on a single frame. Able to tuck their antenna and legs under their body, the bees find beetles difficult to remove. And, honey bee stingers can not penetrated the hard beetle shell. What do Small Hive Beetles do? SHB are strong fliers – traveling miles at a time. They tend to travel at night and locate beehives by smell. (Who can blame them – a beehive producing honey smells great!) This hard shelled beetle walks right in the front door. They are very mobile too. SHB often travel with bee swarms to new locations. The beetles are easily able to keep up with the swarm and infest the new home. You can also get them inside a hive when you buy full-sized hives or nucs. .This is why is it so important to only buy full hives or frames of comb from beekeepers you trust. And inspect any purchased hives, before bringing them home with you. Not every region has beetles at this time. However if Small Hive Beetles are in your region, they will find you. Beekeepers never like to see “unauthorized” insects inside a hive. But, the adult beetles do no real damage. Worker bees chase the beetles and corral them in corners. The honey bees can not sting through the hard beetle shell. So, they try to keep the beetles cornered. But eventually, many of the beetles escape their prison! In fact, we beekeepers unwittingly help the beetles. During hive inspections (which we must do), beetles are able to escape their corners. Then the bees have to round them up again. The goal of the Small Hive Beetle is to lay eggs inside the hive. Once the eggs hatch, beetle larva will use resources inside the hive to grow. When they reach the proper size, they leave the hive and pupate in the soil. But, they leave a lot of damage behind. While adult beetles do little harm inside the hive, they are looking for a place to reproduce. Laying masses of eggs in cracks and crevices, female beetles can produce over 1000-2000 eggs. Beetle eggs look similar to honey bee eggs but smaller. In addition to laying eggs in cracks and crevices, beetles often puncture the cappings of brood cells and lay eggs inside to hide them from the bees. Eggs hatch in 2-4 days and the beetle larvae feeds on pollen, honey and bee brood (developing baby bees). Small Hive Beetle larvae grow to about 1/2 inch in length. They have 3 pair of well-developed legs at the front and row of nubby spines on their belly. After 7-10 days of feeding, larval development is finished. The beetle larvae will crawl out of the front of the hive at night. Burrowing about 4″ deep in the soil, larvae develop into adults in 3-6 weeks. The life cycle of the Small Hive Beetle can vary greatly under good conditions. The time from egg to adult beetle can be very short. And, beetles can live up to 6 months. Reproduction stops in winter – but adult beetles overwinter in the bee cluster. Being a tropical bug, they must have a way to avoid cold winter temperatures. Small Hive Beetles have another “dastardly” trait. They have developed the ability to stimulate a bee’s mouth-parts and receive food. So the honey bees, that are holding the beetles imprisoned, actually feed them. Sneaky beetles. How Many Small Hive Beetles are Too Many? If you see Small Hive Beetles in your hive – don’t freak out. A healthy strong colony can deal with a some beetles. There is no industry threshold for how many beetles are too many. But we do know that honey bee colonies can manage some beetles. Small Hive Beetles are not usually the cause of collapse of a strong colony. However, they can put a lot of stress on the colony. Combined with mites, nutrition problems and other stresses, beetles can be the last straw. If the colony drops in population due to swarming, queen issues or disease, beetles can quickly become a problem. And in the right conditions (a lot of beetles – low bee population), beetles can bring down a good hive. The best plan for most beekeepers is to keep beetle numbers in check. My basic rule : If I see more than 5 beetles, I put several beetle traps in my hive. Beekeepers who live in areas with high beetle numbers, keep traps in all season. When the beetle population grows too big, the colony is in danger. 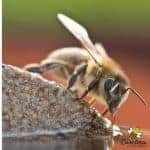 Does the honey bee colony have a lot of space and too few bees to patrol it? This is a very bad situation for the bees. 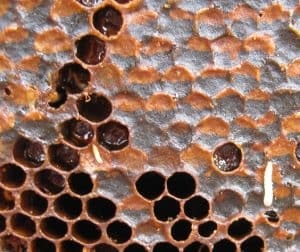 When the situation gets really bad, a large number of adult beetles defecating in the honey can ruin a whole hive. Beetle droppings contain yeasts that cause honey to ferment. You may even have fermenting honey running out of the hive entrance. The whole bee colony may abscond to escape this mess. When beetle populations grow, the problem of adult beetles hiding their eggs becomes worse. They will punch a hole in capped brood cells. Eggs are laid inside the brood cell. Beetle larva develop while feeding on the baby bee. Beetle larva do not destroy the honey comb like wax moth larva. Wax moth larva tunnel through comb leaving“frass”,droppings and webbing. Honeycomb infested with Small Hive Beetle larva takes on a slick, slimy, shiny appearance. You will not see as much slime if the beetle larva are in the brood nest. This is because less honey is stored in the brood nest. 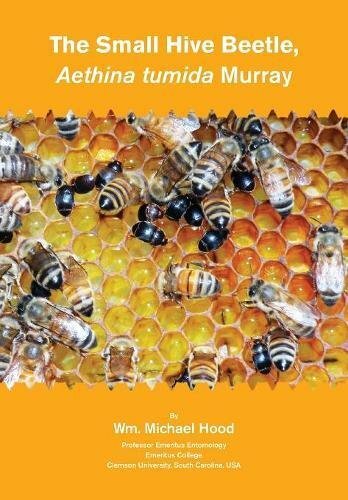 Why Small Hive Beetles are not A Problem in Africa ? Our European honey bees chase adult beetles but they tend to ignore beetle larva. Africanized bees are more likely to remove beetle larva. They will open brood cells containing beetle larva and remove them. This hygienic behavior may be why Africanized bees are better able to tolerate Small Hive Beetles. How Do I Know If I Have Small Hive Beetles? The most common method of detecting beetles is actually seeing them. Beetles don’t like sunlight and will run when exposed to light. When you remove your inner cover, look quickly on the bottom of it. Have a hive tool ready to squish any beetle that you see. Don’t ignore beetle issues. Seeing a couple is no reason for panic. However, more than a few beetles in the beehive are a good reason to develop a beetle battle plan. Beetle larvae pupate more easily in moist soil. Most beekeepers in “beetle country” try to place beehives in full sun. I keep grass and debris away from my hive stands so the ground will be dry. Avoid tall grasses or thick layers of moisture protecting mulch around your hive bases. My bee yard will not win any awards for it’s beauty. It does not look pretty but I want any beetle larvae to find hard, red clay upon leaving the hive. The standard recommendation to fight beetle problems is keeping strong hives. Strong hives can be overcome by beetles but small hives are at the greatest risk. Limit unnecessary inspections. 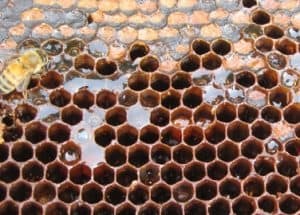 Beekeepers sometimes make things worse by opening hives too often. (this releases trapped beetles). Do you like to feed your bees pollen patties? In beetle areas, extreme care must be taken when using pollen patties. The pollen patty must be small enough to be consumed within 2 or 3 days. Otherwise, your pollen patty may become a beetle hotel. That wasnt actually a trap, it was just a homemade device to remove them. Beetle jails are some of the best traps to use. Would you recommend leaving the beetle jails in year round? I am up in the NorthEast Region during the winter months? Hi Walter, I doubt they would do any good because the beetles will stay in the cluster with the bees. But, I cant think of a reason that it would hurt anything. Unscented Dryer sheets, (yes, the ones for clothes) work too, as well as Swiffer pads….Cut it into smaller squares about 4×4. Then place them right on top of the uppermost frames in the corners. I use a small staple for dryer sheets. 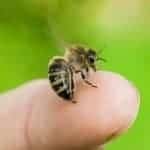 The bees know this is not supposed to be in the hive, so the grab and pull at the fibers….Fluffing it up, when it gets fluffed, the beetles can check in but get stuck. The bees seem to catch on to this quickly, and will chase them down into the traps……Old Farmers trick passed down to me…..Works for me and very inexpensive. Yes, I do know some folks who use them. The whole dryer sheet thing didnt work well for me (and I am still a bit concerned about chemicals) but if it works for you – awesome. Anything to stop the beetles.